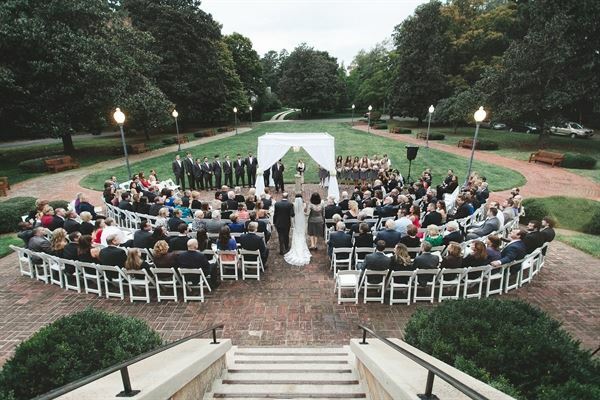 Whether it’s a wedding, a corporate event, or any special occasion, The Mint Museum offers an unparalleled experience unavailable anywhere else in the Charlotte region at its two dynamic locations. At Mint Museum Uptown, you can enjoy beautiful cityscape views, breathtaking architecture, and stunning works of art. Sunday–Thursday $400 Friday–Saturday $500 This educational gallery that surrounds the Van Every Auditorium tells the illustrious history of the Mint Museum from inception to present day. The space can be rented alone for standing functions, or added on to any lower level space to create an ideal wayfinding path for buffet meals or cocktail events. $600 (five hours and $50 each additional hour) This versatile space, on the Lower Level, features Star Gallery works of art by local students (during the school year) and kitchen access. It can accommodate 80 people theater-style, 72 for a seated meal, 36 in classroom style or 30 people board style. It is an ideal venue for smaller seated dinners, corporate meetings, retreats, and seminars. Sunday–Thursday $1,000 Friday–Saturday $1,200 The historic terrace with views of the Mint’s original 1836 façade capped off by the museum’s signature golden eagle, can accommodate 225 for outdoor events or ceremonies. The Eagle Terrace is not available as a stand-alone rental. Sunday–Thursday $1,000 Friday–Saturday $1,200 Our stunning and spacious front lawn is available to rent for outdoor functions. The grounds are surrounded by foliage and gardens that are maintained by the Charlotte Garden Club. Renters are able to tent the lawn in order to provide privacy and protection from the elements. This is not a stand-alone rental, so renters must also choose an indoor space to rent for access to the catering kitchen and indoor restrooms. Sunday–Thursday $1,200 Friday–Saturday $1,600 This gallery on the museum’s Upper Level is a unique setting for art lovers featuring glass-enclosed showcases of work from the Mint’s extensive and renowned Decorative Arts Collection. This space can accommodate 120 for a seated dinner or 140 for a reception. Events in the Delhom Gallery must take place outside of the museum's operating hours. Sunday–Thursday $1,700 Friday–Saturday $2,000 The atrium, featuring natural vegetation and floor-to-ceiling views of the terrace, gardens, park, and sunlit or starry skies, hosts private events after 6 p.m. and during some daytime hours. Rental includes the front terrace, which can be tented, and has a capacity up to 100 for seated dinner or 150 for a reception. Additional space is available for tenting in front of the building. Sunday–Thursday $3,100 Friday–Saturday $3,400 The entire Lower Level, including the atrium, auditorium, Ivey forum, and Heritage Gallery, which details the museum’s history and features beautiful glass-enclosed works of art, can accommodate 250 for a special function. $200 per hour (additional special exhibition fees may be required for certain galleries) The museum’s permanent collection and special exhibition galleries can also be opened after hours to allow guests to conduct a private, self-guided tour the museum. This gallery on the museum’s Upper Level is a unique setting for art lovers featuring glass-enclosed showcases of work from the Mint’s extensive and renowned Decorative Arts Collection. The historic terrace with views of the Mint’s original 1836 façade capped off by the museum’s signature golden eagle, can accommodate 225 for outdoor events or ceremonies. This versatile space, on the Lower Level, features Star Gallery works of art by local students (during the school year) and kitchen access. It is an ideal venue for smaller seated dinners, corporate meetings, retreats, and seminars. The entire Lower Level, including the atrium, auditorium, Ivey forum, and Heritage Gallery, which details the museum’s history and features beautiful glass-enclosed works of art, can accommodate 250 for a special function. The atrium, featuring natural vegetation and floor-to-ceiling views of the terrace, gardens, park, and sunlit or starry skies, hosts private events after 6 p.m. and during some daytime hours. The auditorium, located just behind the atrium, is a 170-seat theater with multiple entrances in the round with audio and video features and multiple entrances ideal for lectures, music performances, and film screenings. * The space is equipped with a removable podium with attached microphone, a projector, and a screen. This educational gallery that surrounds the Van Every Auditorium tells the illustrious history of the Mint Museum from inception to present day. The space can be rented alone for standing functions, or added on to any lower level space to create an ideal wayfinding path for buffet meals or cocktail events.